A black and white photograph of Robert Channen clothed in choir robes. Robert (Bob) Channen is the son of the late Rev. Albert Gordon Channen (1906-1960) and Eleanor Martha Carr (1906-2004). Bob's father was reverent at All Saints' Anglican Church in Whitby, Ontario. 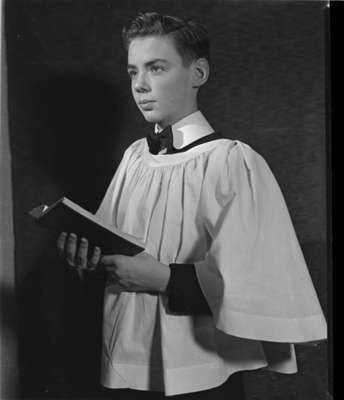 Bob Channen in Choir Robes (Image 1 of 2), 1947, Marjorie Ruddy. Whitby Archives A2013_040_1094.